The Ospreys rugby region has posted a profit for the first time since 2007. Figures published by holding company Llandarcy Park (Ospreys) Ltd showed a profit in 2014-15 of £143,498 before exceptional items and interest charges. Ospreys chief executive Andrew Hore said: "It just shows what can be achieved and we're really proud." The figures reflect increased revenue from ticket sales and improved funding from the Welsh Rugby Union (WRU). 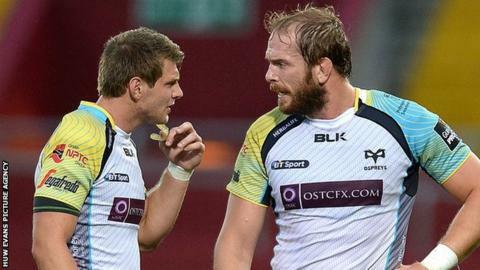 National Dual Contracts - in which the WRU pays 60% of a player's wage - were introduced during 2014-15, with four Ospreys players signed in that period. It was also the first year funding for the four Welsh regions was increased from £6.7m to £8.7m following the signing of the Rugby Services Agreement (RSA) after protracted negotiations between Pro Rugby Wales and the WRU. The profit compares with a net loss of £123,560 in the previous financial year. The figures are for the year running from 1 June 2014 to 31 May 2015. Dan Lydiate (December 2014), Rhys Webb, Dan Biggar and Alun Wyn Jones (all March 2015) signed National Dual contracts during that financial year. Hore added: "A lot of the changes undertaken over the last couple of years actually set us up in a very strong manner for the future, such as changing the RSA and the ability to work more into the community and this kind of thing. "So if we can continue to grow those community links hopefully we can grow revenues in our rugby base as well." Ospreys chairman Roger Blyth said: "These figures are the result of the efforts and hard work behind the scenes, across all departments of the organisation. "We saw a number of new commercial partnerships launched during this period, while the new RSA came into effect, providing a new system to reward national squad contribution more fairly, something which will clearly prove beneficial to the Ospreys given our historic over-contribution to the national cause." Blyth added there was "cautious optimism" about the future, but work remained to be done, particularly improving the domestic Pro12 to compete with the threat of powerful leagues in England and France.